Technology in education remains a hot topic, one with many narratives, challenges, and most importantly, successes. With so many technical topics to choose from, it can be hard to sort and prioritize which new themes warrant a closer look. And while the market is ripe with technical subject matter to pick from, we believe digitalized content is here to stay. 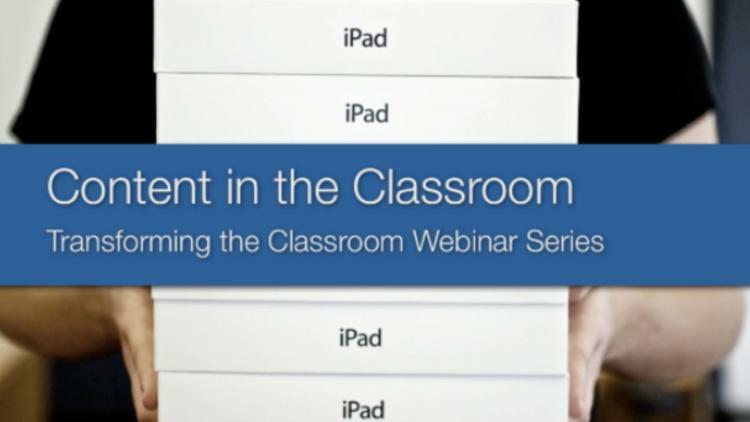 Recently, we hosted the first webinar in our five-part Transforming the Classroom series, Content in the Classroom, which focused on the opportunities presented by the smart integration of digital content in the classroom. A greater understanding of these tools and resources available today can amplify the efforts of our friends in education, regardless of age or experience, and accelerate the learning taking place. If you were unable to attend the webinar live, or would just like to take a fresh look, we’ve posted the recording to our education resources page. And while you’re there, be sure to register for the next webinar in our series, How to Create and Distribute iBooks in Education.